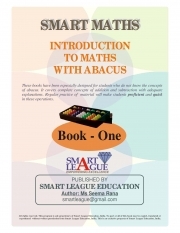 Description of "Introduction to Maths with Abacus - 1 (eBook)"
This books helps children (age 4 - 6 yrs) understand numbers and their significance. Representation of numbers on Abacus is explained. Teachers/Parents can teach numbers and basic addition & subtraction with detailed instructions given in the book. A must for every child to initiate learning of numbers. Seema Rana has been working in the field of Mental Mathematics for over a decade. She has written many books on Abacus. The present series of Smart Maths books are self help books for teachers/parents to initiate young ones in numbers. Reviews of "Introduction to Maths with Abacus - 1 (eBook)"